The Sony PlayStation began as the SNES PlayStation, an add-on peripheral for the Nintendo SNES, but after a dispute between Sony and Nintendo over control of licences, Sony was dropped from the project. Ken Kutaragi, the Sony researcher who had worked on the SNES PlayStation (and the sound chip for the SNES) did not want to give up. He wanted to continue working on this project and so, after some debate, Sony President Norio Ogha approved the start of the Sony Computer Entertainment Division, which would one day account for around half of Sony\'s revenues. This was Sony's entry into the world of video game consoles and would also mean competition for Nintendo. Kutaragi worked on this secret project to create a new 32-bit console that was simple yet powerful, easy to program for and cheap. His original concept was first shown at the Tokyo International Electronics Show in October 1991 and due for release in January 1993 for a price of US$200. The system was still going to allow the play of SNES games (just like the SNES CD-ROM that Nintendo and Philips were currently working on) and it was scheduled for release 6 months before the SNES CD-ROM. 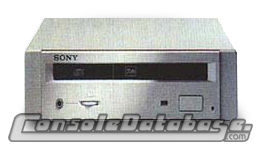 Sony's PlayStation was presented as a console for both games and educational software, with titles such as: Compton\'s Enemy Encyclopaedia, Software Toolworks World Atlas, Microsoft BookShelf 1991, Languages of the World, National Geographic Mammals of the World and Mixed up Mother Goose. There were no games announced yet, but with Sony's money and connections within the video game industry, they were able to get third party support a little later down the track. Namco was one of the earliest third party companies to join. They too wanted to get back at Nintendo for their dispute in 1990. Other third party companies soon joined as well. The PlayStation (a.k.a. PSX) as we know it today is much different. A lot of development was undertaken between 1991 and it\'s release date of December 2nd 1994 (for ¥39 800) in Japan. It was then released in North America on September 9th 1995 (for US$299), selling over 100 000 units in the first weekend of sale, followed by Germany (21st September 1995), the rest of Europe (September 29th 1995) and then Australia (October 13th 1995). Its release was not good news for Sega, whose Saturn console had only just been released. The PlayStation is better than the Saturn in some ways, but the Saturn still has some technical advantages over the PlayStation such as the capability to handle more polygons and better sprite handling in 2D games. But the PlayStation's main edge over the Saturn was that it was much easier to program for, thus developers could make great games very easily for the system and therefore more sales would be made. Unlike the Saturn, the PlayStation has no built-in memory for saving games. Instead, it relies on Memory Cards (sold separately, thus making even more money). The PlayStation was hugely popular due to its huge library of games (almost 1000) and its cheap price. Just before Sony released the PlayStation 2, they also re-released a newer version of the PlayStation called the PSone. The PSone (released 1999) was a smaller, cheaper version of the system (both cheaper to buy and cheaper to produce - the system has no parallel or serial ports), which allowed people who could not afford the more expensive PlayStation 2 to still get a piece of the PlayStation action (much like what Nintendo did with the NES in 1994 and what Majesco did with Sega's Genesis in 1997). Games for the PlayStation were still continuing to be produced even after 8 years since the release of the original PlayStation.